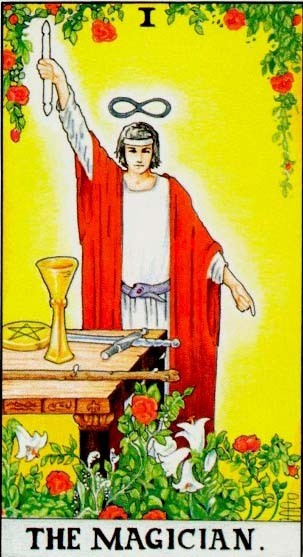 The Hierophant, the fifth Major Arcana, is also called The Pope or The High Priest, the last name being a prove of his connection with the second Major Arcana, The High Priestess. The key idea in his interpretation is spiritual power. 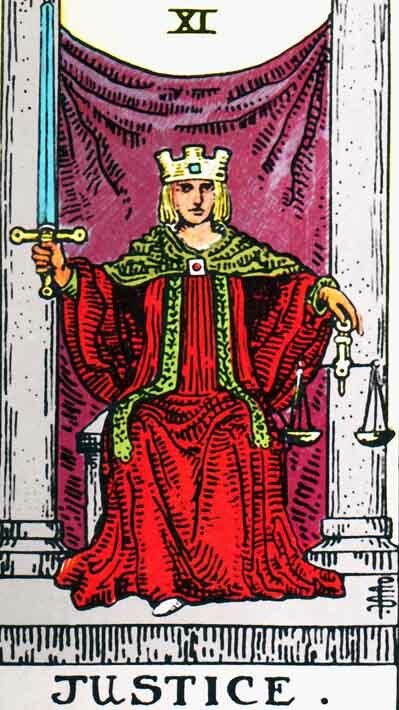 As The Emperor was a ruler with earthly power, a political and military leader, The Hierophant is a spiritual master. 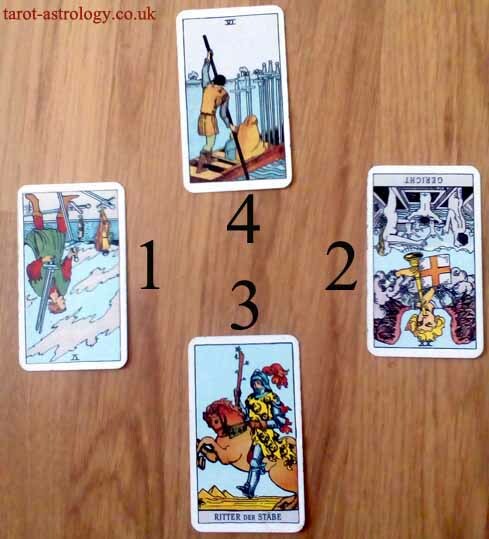 When speaking about the divinatory meaning of the Greater Arcana, Waite offers this list of possible meanings, for the Hierophant: „marriage, alliance, captivity, servitude; by another account, mercy and goodness; inspiration; the man to whom the Querent has recourse“. Reversed, the Hierophant can signify: „society, good understanding, concord, overkindness, weakness“. 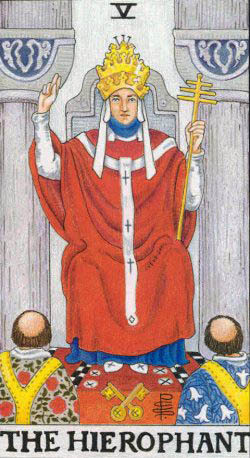 Although the Hierophant has been usually called the Pope, Waite assures us that this is only a particular application of the more general office that he symbolizes: „he is the ruling power of external religion, as the High Priestess is the prevailing genius of the esoteric, withdrawn power“. The power and the knowledge of the Hierophant are coming from above: „he symbolizes also all things that are righteous and sacred on the manifest side. He is the channel of grace belonging to the world of institution as distinct from that of Nature, and he is the leader of salvation for the human race at large. He is the order and the head of the recognized hierarchy, which is the reflection of another and greater hierarchic order“. „ Seek the Path, do not seek attainment, Seek for the Path within yourself“. „Do not expect to hear the truth from others, nor to see it, or read it in books. Look for the truth in yourself, not without yourself“. „Within your soul build a lefty tower by which you may ascend to Heaven. Do not believe in external miracles, expect miracles only within you. Beware of believing in a mystery of the earth, in a mystery guarded by men; for treasuries which must be guarded are empty. Do not search for a mystery that can be hidden by men. Seek the Mystery within yourself“. „The Path is in yourself, and Truth is in yourself and Mystery is in yourself“. Aleister Crowley connects the Hierophant with the Hebrew letter Vau, with the zodiac sign of Taurus and with the planet Venus. 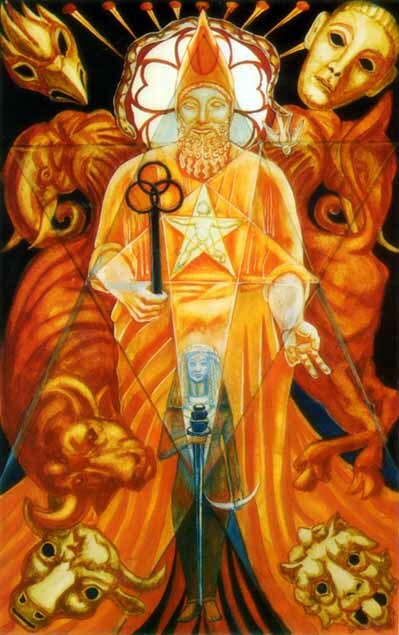 Crowley considers that „the rhythm of the Hierophant is such that he moves only at intervals of 2,000 years“ and that, in the present age, he „symbolizes the law of the new Aeon of the Child Horns, which has supplanted that Aeon of the «Dying God» which governed the world for two thousand years“. Conform to the law and the religion of Thelema, developed by Crowley, all the history of humanity can be divided into a series of aeons: the Aeon of Isis (corresponding to prehistory, when mankind worshipped a Great Goddess), the Aeon of Osiris (corresponding to the classical and mediaeval centuries, when humanity worshipped a singular male god) and the Aeon of Horus (controlled by the child god). According to this theory of eons, the Hierophant proclaims the aeon of Horus: „It is the aeon of Horus, of the Child. 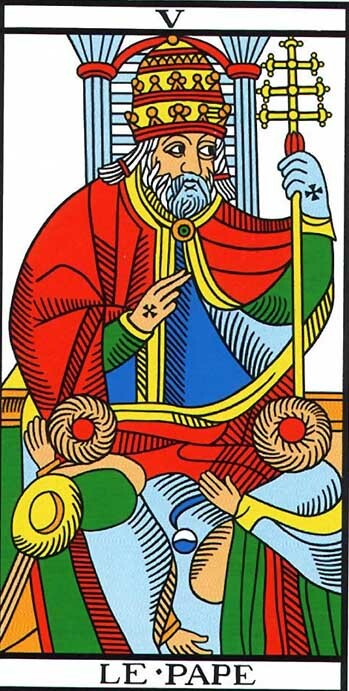 Though the face of the Hierophant appears benignant and smiling, and the child himself seems glad with wanton innocence, it is hard to deny that in the expression of the initiator is something mysterious, even sinister. He seems to be enjoying a very secret joke at somebody’s expense. There is a distinctly sadistic aspect to this card; not unnaturally, since it derives from the Legend of Pasiphae, the prototype of all the legends of Bull-gods. These still persist in such religions as Shaivism, and (after multiple degradations) in Christianity itself“. In the Divine. Reflex of the Will—INTELLIGENCE (characteristic of God the Son). In the Human. Reflex of the Power—AUTHORITY (characteristic of the Woman). Religion. Faith. In the Natural. Reflex of the Soul of the World, or of the Universal creative fluid– THE UNIVERSAL LIFE (characteristic of Natura naturata). Share the post "The Hierophant– Major Arcana Tarot Card Meaning, according to Waite, Ouspensky, Crowley and Papus"